My lovely wife picked it up at a discount store for $20. I figured even if we didn’t give it as a gift, we could use it to store throw pillows and blankets. The trunk was about 5 feet long, two feet wide and 3 feet high. It was made entirely of plywood. And not expensive high grade plywood. The reason it’s called plywood, is that it’s made of layers, or “plys.” The more plys the more wood, the less warping and the more expensive. High grade plywood has 7 plys. Typically the outer layer of plywood is the nice looking version. It can be maple, or oak. Our new project had five plys and the outer layer was pine. The lid was broken off. 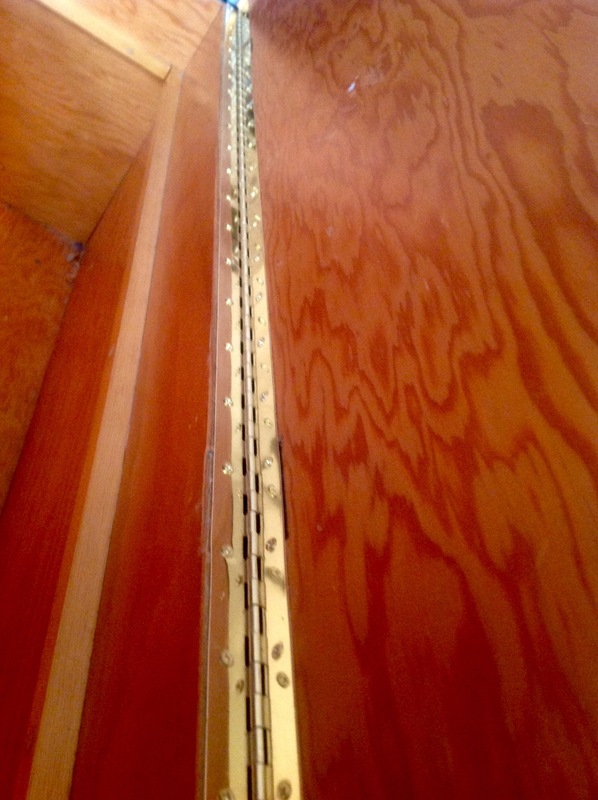 Plywood is reasonably strong if you screw into the face of it, but if you screw into the edge, your screw is simply churning in between the layers. That’s how the lid had been attached. The long ago carpenter had used typical wing style hinges, like you might find on a door, only smaller. When I saw that they were attached with flat head screws I just rolled my eyes. No one uses flat head screws anymore. Plywood is rated by the number of layers, or plys of wood. This wood is 5-ply. Was it really worth it? A plywood box held together with wood screws. Why even bother? Still, with my superior materials and tools, maybe I could make the trunk serviceable. Little did I know how wrong I was. It’s easy to look at what came before and laugh at how simple things were, how backward and how much better we are today. And yet, we don’t often think about how technically brilliant early pioneers were. When I started working in computers in 1988, my first computer was an 8088 with 640KB of memory. Today’s computers are thousands of times faster with millions of times more memory. For example, when you take a picture with a 2.4 megapixel camera, the picture will take up four times more memory than I had in my entire first computer, and that’s on a cellphone. So, we have much better computers, do we have better computer programmers? The challenge when writing programs 30 years ago was that you had to make every byte count. You had to think first about space and second about speed. It’s sometimes hard to remember the constraints that early programmers and users had to work under. I remember the first time I tried to download a picture off the internet. It came down in 5 or 6 files, and each took several minutes. You had to be very selective about what you chose to transmit over those old 2400 baud modems. That would be the equivalent of a 0.0024 MB speed compared to today’s high speed . So, how did the computer programmers and system engineers evey manage to build systems? Are their systems the equivalent of a Model A automobile or the Kitty Hawk which flew less than 75 feet on it’s first flight? Not necessarily. TCP/IP, for example, is ancient in computer time. It was first introduced in 1982, more than 30 years ago. We still use it. Also in 1982, SMTP was developed. It stands for Simple Mail Transfer Protocol. You may not be familiar with the acronym, but every time you send an email, you are using it. The protocol has been modified many times, of course, but it’s still sending email all around the world. The JPEG format, that many web sites use was developed in 1990. My point is that we are still today using many of the protocols that were developed decades ago. I work with brilliant programmers, but I don’t know that the programs they are writing today will still be in use 30 years from now. Those pioneers were really, really good. We sometimes forget that. 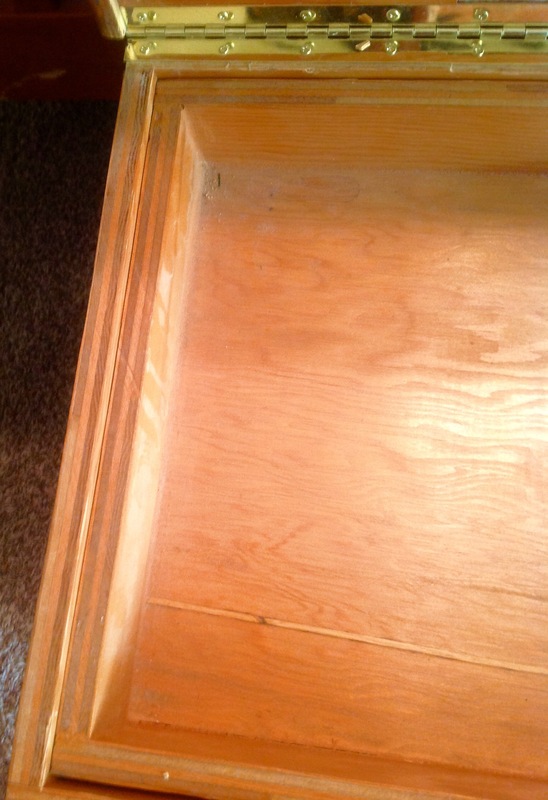 My plywood box has some pretty serious water damage on the bottom. I stripped of the bottom pieces of playwood and replaced it with hardwood. The plywood pieces I was replacing literally came apart in my hands. Instead of wooden plugs hiding flathead screws, I used a high grade wood glue and a pneumatic nail gun. This round light colored spots are wooden pegs that are hiding the screws holding the box together. But as I worked, I noticed something. While the materials might have been simple plywood, the craftsmanship was better than I was expecting. In fact, it was much better. As I started refurbishing this old trunk, I started thinking about that long ago carpenter. He no doubt used hand tools. I was using cordless drills, and power tools. He was using 5 ply, plywood. I had beautiful oak hardwood. And yet, I realized that with all my advantages, I wasn’t half the carpenter he was. 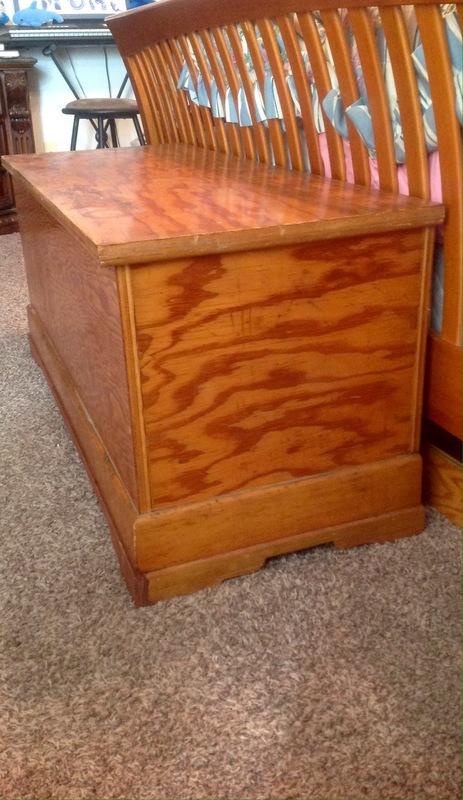 I quickly came to appreciate the care and skill he had used to not just build a box, but craft a piece of furniture. Do I make things that some future carpenter or IT person will appreciate as a work of superior craftsmanship? I don’t know. I do know that I started putting more thought into the repair project I was doing. I replaced the original hinges with a 5 foot long piano hinge. All pictures are of the completed restored box.